Charlie Keene has poured everything she's got into running her father's concrete company, and now her brother wants to sell. Worse, handsome acquisitions specialist Jack Maguire's arrived in town...and he wants to buy. Charlie's worked too hard to let the family firm go. One delicious dance and an even more surprising dinner later, all bets are off, as Charlie draws Jack into her Carnelian Cove world. But what does he really wanther or her company? And can Charlie ever trust a man in love if she can't trust him in life? 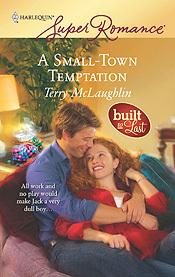 Terry is fortunate to live in the real-world inspiration for the fictional settings of her Small-Town series. Carnelian Cove is a blend of communities in Humboldt, Del Norte, and Mendocino counties in northern California. "A Small-Town Temptation draws the reader in and thoroughly entertains with engaging characters, an excitingly different storyline and a small town setting that beckons us to visit." "...good writing and lively dialogue make A Small-Town Temptation a fun and joyous story."